God made Men, Tailor made Gentleman! Then what did cobbler do? He maintained that repo! Tailor and Cobbler both are brothers in arms. You are at your best only when they work hand in hand. No attire is complete without complementing footwear and which pair will do is a big question. 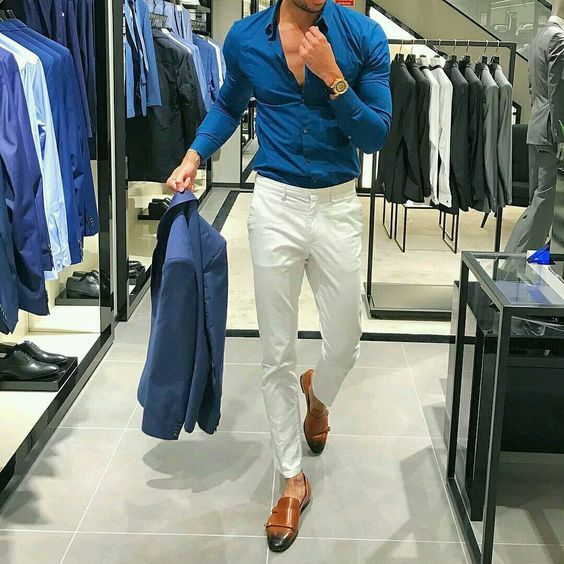 Men's attire is simply classified into three broad categories Formal, Casual and Traditional. Which leads to three pairs of shoes: Black or brown leather shoes, sports shoe and Jooti. But friends these are the talks of the past. Fashion has evolved. Now if you search "formal shoes" you will see Oxfords, Derby, Brogue etc. Same goes for sports shoes, just search for it and you will get running shoes, weight training shoes, outdoor shoes, and shoes specific to every sport. When you have such wide range to choose from, confusion is obvious. Well, friends let me give you some tips and tricks for best suitings. 1. Formals: Oxfords and Brouge are the best in this category. They go with most of the formals but if you are short hight Chukka is a good option for you. 2. Semi-formal: When it's not a business meeting, you are not suited up but in sheen shirt and pants, go for Monk Strap or Lofer. They are stylish and eye-catching too. a. Shirt with Denim: Best option "Chelsa Boot" it looks so classy and comfy. You'll Love it. b. T-shirt with Denim: Our all-time favorite and goes best with outdoor sports shoe. If you are heavy build try to go for Jordans. They will compliment your physique. c. Pullover with Lower: Most comfy outfit should go with comfy footwear and the best are Running/Jogging Shoes. 4. Traditional: Rajasthani Jootis have been the first choice in this segment but Boat Shoes and Loafers have made remarkable entry as they go stunningly smooth with Indo-westerns. 5. Sports: The most loved and misused category of shoes. Sports shoes provide you agility, comfort, and abundance of style. Sportsman knows the specialty of sports shoes lies in their sole which differ from sport to sport. But a nonsports person might not know the difference. So just a simple advice, Go for outdoor shoes or at max running shoes but don't wear Badminton or Tennis shoes for walking. 1. Studs: Go for high ankle and heavy shoes. It compliments! 2. Short guys: Pump up shoes will take the attention away from your height and make you look athletic. 3. Heavy Guys: Loafers will portray you as subtle and stylish. 4. Lean Guys: Sneakers go along with your physique and makes a statement. Well, there is a lot to say but I won't bombard you with too much at a time. Fashion and Style evolves and so are we and our wardrobe.